Hidden New Jersey: Lighthouses in Jersey City? Not quite, but close. Right now there are two lighthouses in Jersey City. There used to be just one, and once spring arrives, it's likely the city will be back to just one again. Well, that's not exactly accurate. Neither is a lighthouse, but their original purpose was much the same. Both are actually lightships, sailing vessels that were once stationed at dangerous places offshore to warn oncoming vessels of shoals and other hazards to navigation. The benefits of a ship over a lighthouse are pretty obvious: they can go places where it's too difficult to build, they can be moved as needed, and they're likely more cost effective for the same reason. Today, the Coast Guard uses large lighted buoys to do the same work, rendering the lightships obsolete. Like many lighthouses, though, some of the ships have taken on new lives, and it would seem that their mobility is a real asset in that regard. One of the Jersey City lightships, the Winter Quarter, is berthed, seemingly permanently, at the New York Harbor end of what used to be the Morris Canal. You might know the place better as the Liberty Landing Marina next to the old Central Railroad of New Jersey terminal in Liberty State Park. The Winter Quarter now holds offices for a yacht dealer and other businesses of interest to the boaters who leave their pricey craft at the marina. 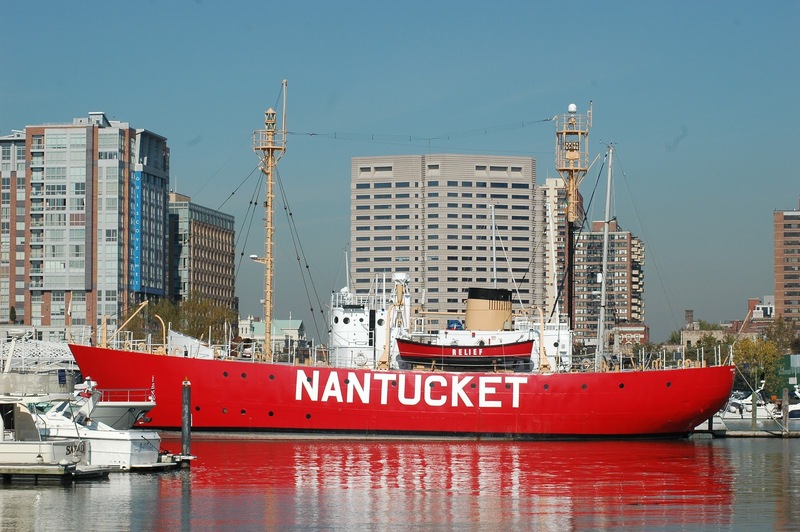 Our visitor, the Nantucket, has a somewhat classier job as a floating vacation rental property and events location, and you can see her bright red exterior very clearly from across the marina. Turns out that this is just the most recent of a series of lightships that guided water traffic near the treacherous Nantucket Shoals from 1850 to the mid 1980s. Contrary to the old superstition about renaming ships, It was fairly common in those days for those in the light service to take on new names when they were relocated. 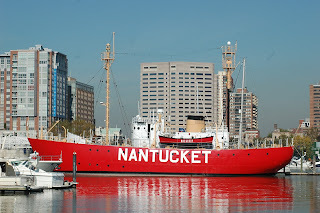 Built in 1950 as Lightship 612, our visiting Nantucket was the very last vessel to serve as a lightship in the US Coast Guard, being retired in 1985. During her 35 year commission, she served in three other locations - San Francisco; Blunts Reef, California; and Portland, Maine - before her final station in Nantucket. When I visited the marina to take a few pictures, I had to laugh, considering the history of the area. Here were two important guides to navigation, placed at either side of the end of a man-made canal that was engineered for safe passage and speedy travel. The practicalities of the current day often have an interesting impact on historical sites and relics, don't you think? In any case, repurposing things means they'll be available for future generations, even if it requires a bit of imagination to see them as they once were, not as they are today. Thanks to our friends at Bowsprite for pointing out the Nantucket's current location. If you're interested in the comings and goings in New York Harbor, check them out!